If at first you don’t succeed, try, try again…… aka third time unlucky. Does The Secular Stagnation Theory Have Any Sort of Validity? In a number of blog-posts (Paul Krugman’s Bicycling Problem, On Bubble Business Bound, The Expectations Fairy) I have examined some of the implications of the theory of secular stagnation. But I haven’t up to now argued why I think the hypothesis that Japan and some parts of Europe are suffering from some kind of secular stagnation could well be a valid one. Those who have interest in neither Catalonia nor the issue of journalistic standards will probably find this posting long, tedious, and not especially interesting. Perhaps you might like to stop at this point. Those of you who are interested in one or other of these, well, I invite you to read on…..
“the risks are rising that the economy will later be determined to be in recession,” said Yuji Shimanaka, chief economist at Mitsubishi UFJ Morgan Stanley Securities Co.
As noted in my post – Does Abenomics Work? – (published 19 September) the tide of media opinion finally seems to be turning against Shinzo Abe and his economic reform plan for Japan known as “Abenomics”. The degree of skepticism being shown only seems to have grown on the back of a slew of recent data confirming the impression that the recovery of economic activity from the post sales-tax slump isn’t going to be as easy as either the Japanese government or the Bank of Japan initially thought it would be. 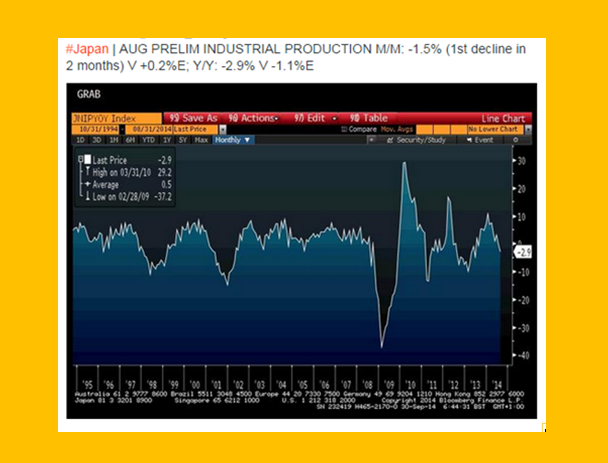 As the authors of the Bloomberg report from which the above quotes are taken – Oops Japan Did It Again? Sales-Tax Spurs Recession Debate – put it: “Weak industrial production data from Japan today raises concern that the world’s third-largest economy may be back in recession, challenging Prime Minister Shinzo Abe’s growth strategy.” In fact, output which was down 1.5% between July and August (and down 2.9% over August 2013) has fallen in three of the past five months. When Barack Obama told a CNBC interviewer last autumn that Wall Street ought to be “genuinely worried about what is going on in Washington” in reference to the US government shutdown he raised more than a few eyebrows. Normally political leaders try to calm and reassure markets, so this attempt to stir them up on the part of the US President was, in its way, something of a first.